January 7. Day 23. I woke up early and wandered my way to the travel agency where Eddy was scheduled to pick me up. 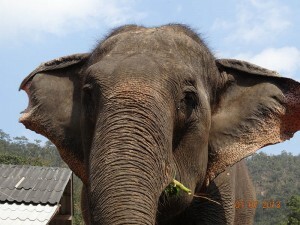 After doing a lot of research, I found vast differences between the elephant camps that were available near Chiang Mai. 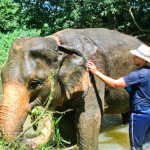 Eddy Elephant Chiang Mai repeatedly showed up high on the customer review ratings and more importantly, they treat their elephants with love, respect, and don’t abuse them. They don’t play football (soccer) nor do they draw pictures. They eat, sleep, and wander the mountain jungle – freely – as it should be. Eddy picked me up in a mini bus filled with about 9 other people. I was the only one staying for 3 days whereas everyone else was only staying for 1 day (arrive in the morning and leave after dinner time). First stop? 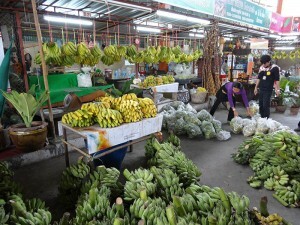 Banana market. 40 baht (66 cents) was enough for a large bag of fresh bananas and a couple thick sticks of sugar cane. Eddy told us the elephants love their treats. During the 1 hour drive to the camp, he told us about the life of an elephant. They are awake 20 hours a day and eat all day long. They only digest about 60% of what they eat and they don’t have a stomach so everything they eat, is literally just passed through. Since they don’t have a stomach and process so little, they have to eat all day long in order to get the nutrition they need to grow and be healthy and strong. Most of the elephants (“chang” in Thai language) sleep lying down on their side. Some find a tree to lean against and sleep standing up. They snore like humans; only much, much louder. When they aren’t sleeping, they’re eating. Eddy has 19 elephants. 16 adults and 3 babies. He gave us a quick and to-the-point safety warning: they are big and extremely sensitive, so we must be careful at all times when near them. They are also 10+ feet tall so we need to make sure we don’t fall when we’re riding them, otherwise a fall from that height will hurt. A lot. “First I teach you elephant language. Then you ride. When I say you good enough. Bye bye. Off into jungle you go. Just you and elephant. Happy times.” His broken english and playful demeanor put everyone at ease – especially because a few of the people mentioned their fear of large animals. We arrived at the camp and gathered under a bamboo hut. He taught us how to talk to the elephants. He said the command, taught us what it meant, and then we repeated it. After 20 minutes of this, we all knew the commands. 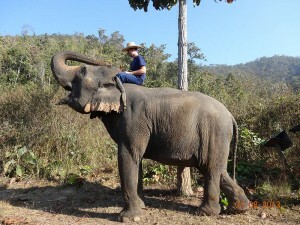 “Jah long” tells the elephant to lower their head so we can walk up their trunk and sit on their head, turn around, and settle in on their neck for a ride. 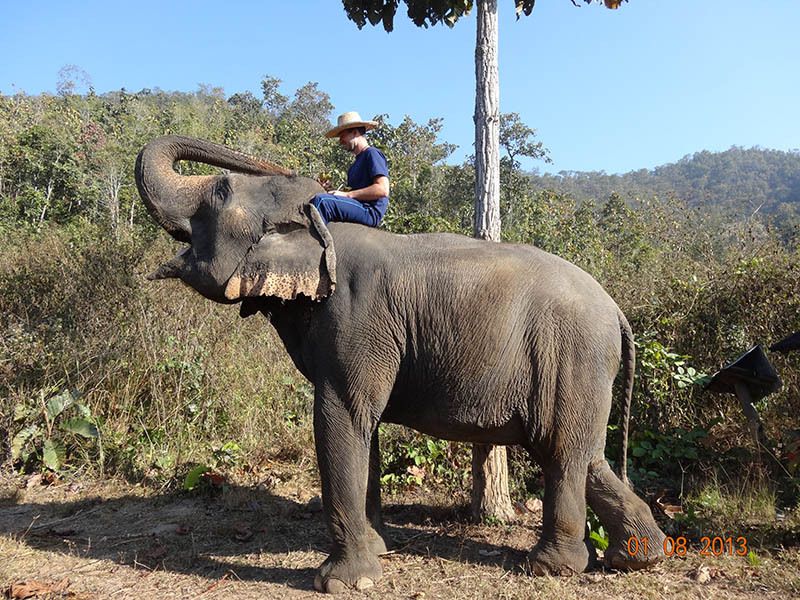 “Song soon” tells the elephant to lift their leg so we can use it as a step to then jump up on their back and then settle in on their neck for a ride. 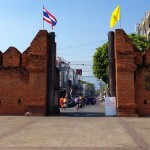 “Mae long” tells them to sit and lay down. 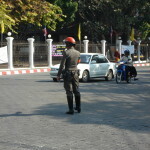 “Gway gway” while kicking on the opposite side, tells them which way to turn. Kick right, go left. “How how” means stop. As we finished learning the hill tribe chang language, out of nowhere, Boonchinnuh appeared. He is a small male elephant 15 years old and weighs about 2500 kg. He is ~8 ft tall and lifts his head over the bamboo railing to say hi to everyone. Everyone was glowing and smiling from ear to ear. 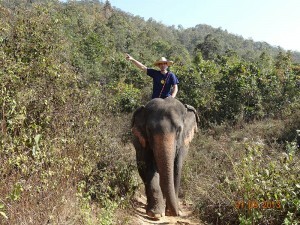 Then we headed to the area where the elephants slept to get our first lesson in riding. 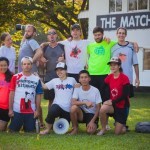 We met Mae Kum Noi, Mae Noi, Boom Pui, and Arranyuh. Eddy grabbed me, took me to Arranyuh, introduced me to Meh (Arronyuh’s full-time mahout and caregiver) and told me she was mine for the next 3 days. Anything she needed or wanted, I had to provide for her, and in turn, she would protect and look after me. Just then I remembered that cobras and king cobras are quite common in the wooded areas of Thailand so I took the last part very seriously. Arronyuh was a 57 year old cow (female elephants are called cows and male elephants are called bulls) weighing in at ~4500 kg. She was an asian elephant and has a life span of ~100 years. Meh stood about 5’4″ and might have weighed 125 lbs. He was slender and tan. His face looked innocent and his eyes were almost black as night. He didn’t look like he could possibly take care of or commend respect from such a large animal, but I learned otherwise within minutes. The bond between them was strong so I tried very hard to mirror his actions and demeanor around Arronyuh so I could earn her respect and trust. The bonding between Arronyuh and I began with the first time I asked her if I could go near her. Meh mentioned they scare easily. And since they are so big, they will defend themselves fiercely if agitated or approached when they don’t want to be bothered. Step 1 – find elephant. Step 2 – call their name. Loudly. 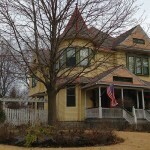 Step 3 – say “how how,” which means stop. ARRONYUH – HOW HOW!! She looked deep into my soul, paused for a few seconds, then started to flap her ears. Meh said if she flapped her ears, it was ok to get close and touch her. If I didn’t see her flapping her ears, walk away and try again later. No meant no. As I walked closer to Arronyuh, she began to playfully sway left and right. She showed the markings of a white elephant and had the prettiest eyes. The wrinkles on her face were like canyons that started high on her forehead and the corners of her eyes and continued snaking down her face like a map of the river nearby until they disappeared under her chin. Parts of her skin were slightly bleached from years in the hot Thai sun. Her wrinkled face gave me long, non-comprehending stares as I stared back quietly and squinted at her noticing each beautiful mark on her face. Even when I wasn’t looking at her, I could still feel her eyes on me, almost staring through me. I wondered about her life and years in the camp, the tons of bamboo grass she had eaten, and the memories she carried with her (After all, an elephant never forgets). I wondered about the loneliness she must have felt when her visitors left, her family and if she has ever had babies of her own. I wondered who has wronged her, taken advantage, stolen, or broken her trust. I wondered what made her smile, I mean really smile, and I wondered about happiness in general; both hers and mine. Our bonding was deep and almost instant. Her skin was dark gray, her eyes large, chestnut colored, and the size of golf balls. Her trunk was long and powerful. I learned just how powerful during our time in the jungle as she snapped 6″ thick trees like match sticks. Meh and I ride Arronyuh everywhere together. He was there just in case Arronyuh acted up or decided she didn’t want to listen anymore and do her own thing. She never misbehaved even once. We rode to the top of the highest mountain peak nearby. The valley was several miles across. Fog would lay low in the valley early in the morning and began to burn off as the simmering heat of the Thai sun rose to paint the land in vibrant energy and color. Lunches and dinners were served down at the hut where we first learned our elephant commands. Sue brought me fresh fruit, mushroom soup, and tradition Thai dishes and they were all absolutely delicious. Green beans, tofu with spicy sauce, egg fried rice with pineapple, sweet and sour sauce, zested with a squeeze of lime was my first dinner. The elephants ate large bundles of bamboo grass that I personally spent several hours every day chopping with an old rusty yet sharp machete. They also dined on large bundles of bananas and stalks of sugar cane. Sometimes we could eat the sugar cane ourselves as a nice treat in the middle of the day. Arronyuh listened very well when she was eating and hiking or when she had just eaten. If she didn’t eat for a while (20 minutes), she became ornery and stubborn. Night time approached and Click (his name is more of a sound and can’t be spelled using the english language) and I assembled my tent. He gave me a thick comforter for the cool mountain air, a big soft pillow, and bottle of water. 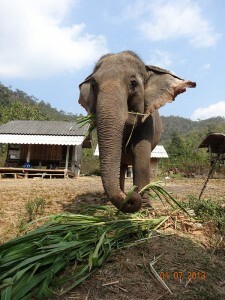 We took turns feeding the 5 elephants that I watched over and took care of every hour through the night. Boonchinnuh, Arronyuh, Boom Pui, Mae Kum Noi, and Kum Noi became my “babies.” I looked after them and learned to read their body language very quickly. I could tell when they were nervous, happy, or wanted some attention. The sky faded to black by 7pm and the air turned frigid. We lit a fire and all had a Chang beer while trying to bridge the language barrier between us. Collectively, we spoke English, Burmese, Thai, and the mountain tribal elephant language. 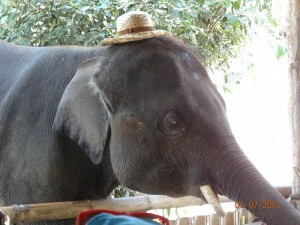 The mahouts all wore long pants, long sleeve shirts with jumpers, jackets, scarves, beanies, and gloves. They didn’t handle the 50 degree night air very well and consistently hovered so close to the fire I thought they would spontaneously combust at any moment. I was wearing shorts and a tank top. We took turns playing guitar, singing, drinking, and laughing well into the night. 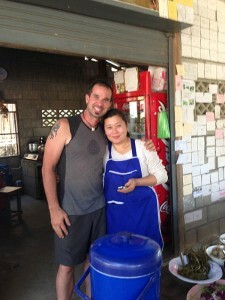 I felt welcomed and part of the family there at Eddy Elephant Chiang Mai. 4 am arrived with the sudden and very loud cry from Arronyuh. Click came over and told me she was hungry. It was time to get up and feed her. And the others. With an hour, I made my bed and all 5 of theirs, everyone was fed (except the mahouts and I), and it was time to hop up and go for a morning ride with Arronyuh. We watched the sun rise over the hilltops, fog bake away, and then I gave her a bath in the nearby river. We wander aimlessly and hours pass by in the blink of an eye. After being up for nearly 4 hours, it was finally my turn to eat. For breakfast I devoured stir fried veggies, curry rice, more fruit, green tea, and 2 eggs over toast. The best kind of toast; browned over the crackling glow of an open wood fire. After I finished my breakfast, Meh and I chopped more bamboo grass and stocked up on food for the elephants for that day and night. We again wandered off into the jungle for another ride and I could tell she was happy. Her ears sway to and fro to fan herself and listen for what was near. When she heard something, she would stop and the sounds of the jungle grew loud. Normally, the only thing I could hear was the sound of things breaking as she pushed through the dense forest and ripped branches and vines from nearby trees for an on-the-go snack. She was nimble like a mountain goat and climbed 50 degree inclines with ease. I didn’t think she could do it until Meh pointed her left. We were walking along what I would have called a wall on the left when he nudged her right side, gave her a sturdy kick, and yelled out “gway gway!” Her weight shifted left and up we went. No sliding, no loose footing; just raw power gripping the earth as she slowly scaled the steep hillside with ease. We all had lunch and went to greet some new visitors afterwards. 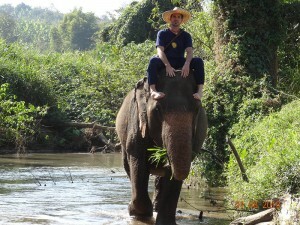 I strapped her saddle/seat and took a few tourists for a ride through the jungle. They were just as amazed as I was with their first ride. I took Arronyuh back to her bed so she could eat and relax for a few hours while Click and I headed to the bamboo grass field nearby where I once again donned 2 gym socks over my arms, grabbed the machete, and clear-cut what felt like an acre of grass. I had blisters on my right hand; one that popped and began to bleed as I swung the old blade. The protective sleeves helped, but didn’t prevent the razor sharp blades of grass from slicing into my flesh a few times. Dust, dirt, blood, and sweat. Then we rested. We watched the setting sun over the mountains and Click showed me pineapple, coconut, mango, lomken, fussen, banana, sugar cane, and a handful of other crops I can’t even remember the names of. We removed the western style thief hanker-chiefs from our faces so we could breathe and Click handed me a small brown piece of food. It was called fussen and was a small jungle fruit found high in the trees that was extremely bitter – almost inedible by itself – but tasted sweet when chased with a shot of water. As the sun bathed us in a warm red glow, we sat in the grass and shared some rice moonshine with our fussen; me, Click, Chai, and another man whose name I couldn’t pronounce or remember. As dusk approached, we drove back, unloaded the truck, and I ventured up to the elephants sleeping area to make their beds for the night. 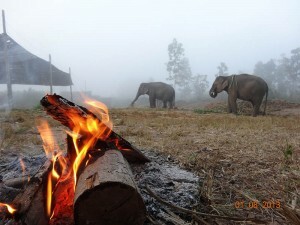 The mahouts and I stoked the fire and sat down. Meh came over, sat next to me, and said in broken english, “teach something me.” The first thing that came to mind was yoga. Before I knew it, I was teaching asanas to a group of Thai mahouts in the northern surrounding mountains of Chiang Mai. 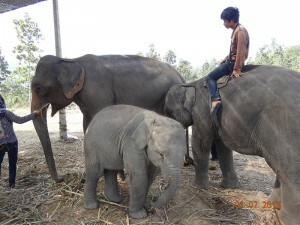 In return they taught me some more specialized elephant commands, a bit of Burmese, and more Thai language. The word “language” seemed to pose quite a bit of difficulty for all of them as they would instead say “ranguage.” The next 2 hours were spent doing arm balances and learning 4 different languages under the bright moonlight drenched in the sounds of the jungle and crackling of the wood fire. The occasional elephant chomping was also a common sound as all 5 of them shielded us from the potential dangers of the surrounding wilderness. We all woke up at 4am again, ate breakfast, went for a trek through the jungle, and gave the elephants their morning baths in the cool river. As we hiked back to the camp, we told jokes, and shot each other with slingshots. I gave Arronyuh one last bundle of bamboo grass and struggled through my goodbye with Meh. He and I both teared up as we hugged and said goodbye. We grew to respect and trust one another deeply in those 2 previous days and nights. Just like the elephants, we protected one another. A brief yet tense moment dealing with a large snake came to mind from the day before. Then came the hardest part; saying goodbye to Arronyuh. I wept as I hugged her trunk. 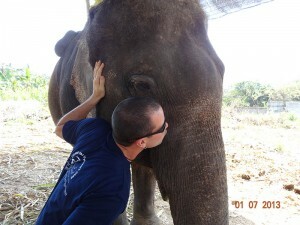 She purred and gently nudged me back a step or two and hugged me in return with her trunk. Before I knew it, she gripped me firmly and lifted me off the ground. I laughed uncontrollably and the tears subsided. She eased me back to the ground and I kissed her on her trunk and patted her chin. I never thought I could grow so attached to such a magnificent creature in such a short amount of time. As I walked away, again crying, I could hear footsteps running up behind me. I turned to see what it was and there stood Meh; crying as well. He held out his hand, took off his ring and gave it to me. Click told me this ring was made from Arronyuh’s hairs. Having a ring like this was good luck because the mahouts wouldn’t pull the hairs from the elephant, they had to search for them through their beds – which was literally like searching for a needle in a hay stack. After the hairs were braided, they were then dipped in resin to make them waterproof and rigid enough to wear as a ring. I gave him another hug and was on my way. I didn’t eat much for breakfast that morning due to my recent goodbyes and instead focused on writing down what I experienced those 3 magical days and nights. Be well. And namaste. What is the most amazing creature you’ve gotten to know or spend time with?